Although The Forever Knight is a direct follow-up to John Marco's original Bronze Knight trilogy, this novel is deliberately written to serve as a standalone entry. Although it's been called a reboot - I really hate that term - that is most definitely not the case. Marco doesn't negate or reinterpret events of the first series, and doesn't rewind the chronology to make a fresh start. It is, instead, something of a reset or a refresh, a chance to establish Lukien as a protagonist for new readers, and set him up for new adventures to come. In that sense, the story suffers a bit from the proverbial 'middle book' syndrome, in that it seems like more of a side-wise detour than the epic journey one might expect. It's an engaging enough detour, entertaining from start to finish, but all the talk of prophecy, destiny, and mysterious purposes makes you feel as if Marco is warming us up for something big . . . something that's only teased here. Lukien is an interesting hero, a flawed protagonist with some unusual issues and motivations. Immortal - for all intents and purposes - he's already faced his demons, won his battle, and come out the other side, not quite alive, but not unscathed either. He's a man without a purpose, a hero looking for a cause, with only a ghost and a child to keep him grounded. Lukien is an easy man to admire, although a difficult one to like. His anger often gets the best of him, and his mood swings can be just as rough as his scarred, one-eyed appearance might lead one to expect. If there's one aspect where the narrative suffered a bit for me, it's in the single point-of-view we share with Lukien. With his frantic sojourns to-and-fro, there's so much happening behind him that there could almost be another book lost in the details there. More than that, though, it leaves the climax of Cricket's story to happen off the page, denying us the drama, and redirected our sympathies from her to Lukien. That may very well be a deliberate move on the part of Marcos - Lukien is the protagonist, after all - but given that she represents the only real danger, vulnerability, and weakness in the tale, I felt cheated (in a fashion), of seeing her arc through to the end. That POV issue aside, this is a fast-moving, richly-detailed novel that goes to some very dark, very grim places. Mad would-be-emperors, armies of the dead, thieving merchant-kings, demon monstrosities, and more populate the landscape, providing Lukien with something to rail against. There are also elements of humour and moments of sympathy, balancing out the tale and providing a thematic counterpoint to the rejuvenation of the protagonist at the heart of it all. Marco does a superb job of recapping previous events in a natural manner, weaving memories and recollections into the story where it makes sense, rather than badgering the reader or hitting us over the head with backstory info-dumps. Not having read the Bronze Knight trilogy (yet), I can't say how compelling this volume will be for fans of that series, but I know it's made me want to continue reading. John Marco is the author of seven previous books. His debut fantasy series, Tyrants and Kings, earned him a Barnes and Noble Readers Choice Award and has since been translated into numerous languages around the world. His first three novels of Lukien, The Eyes of God, The Devil’s Armor, and The Sword of Angels have received high praise. 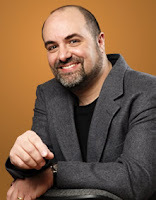 In addition to his work as a novelist, he is also a proud and avid nerd and blogs at his website, thehappynerd.com. He lives on Long Island with his wife and young son. Just wanted to stop by and thank Bob again for taking part in the book tour. Really appreciate it. I love that I don't have to start the series at the beginning - I don't think my TBR list could stand the addition of an entire new series, and this does sound like a great book! I'm a little more interested knowing that this is something of a stand alone. I've lost his first 3 novels over the years from all the moving. I saw this at the bookstore the other day and it was surprisingly thin. The cover did turn out nice as well.